Only A Matter Of Time Before US/Russian Conflict In Syria? Is the escalating conflict in Syria setting the stage for World War III with Russia? On Sunday, a U.S. Navy F-18 shot down a Syrian Army SU-22 near Raqqa. This represents a major escalation by U.S. forces, because this is the very first time that the U.S. military has shot down a Syrian warplane since the civil war began back in 2011. Russia has said it will treat US warplanes operating in parts of Syria where its air forces are also present as "targets" amid a diplomatic row caused by the downing of a Syrian jet. The country's defence ministry said it would track US-led coalition aircraft with missile systems and military aircraft, but stopped short of saying it would shoot them down. A hotline set up between Russia and the US to prevent mid-air collisions will also be suspended. The Russians have some of the very best anti-aircraft systems on the entire planet, and they would be more than capable of shooting down our jets. 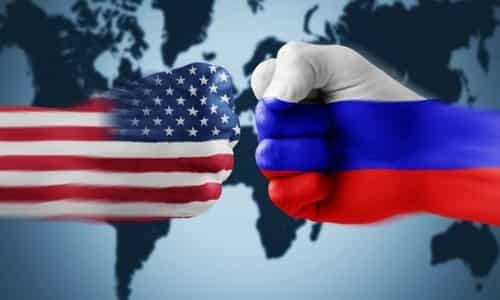 So let us hope that the Russians don't cross that line, because the anti-Russian hysteria in Washington would go to an entirely new level if footage of U.S. jets being blown out of the sky started running 24 hours a day on CNN, MSNBC and Fox News. The Pentagon said the downing of the aircraft came hours after Syrian loyalist forces attacked U.S.-backed fighters, known as the Syrian Democratic Forces, in the village of Ja'Din, southwest of Raqqa. The rare attack was the first time a U.S. jet has shot down a manned hostile aircraft in more than a decade, and it signaled the United States' sharply intensifying role in Syria's war. Most Americans have absolutely no idea how close to war we are in Syria. One wrong move and we could easily find ourselves in another war in the Middle East which would be far more serious than the wars in Iraq and Afghanistan ever were. That is because we probably wouldn't just be fighting the Syrian government. We would also likely be fighting both Russia and Iran. Iran's military said Sunday that it has launched several missiles into eastern Syria, targeting Islamic State fighters in retaliation for the twin attacks that rocked Tehran on June 7. For the United States, there is nothing to be gained by getting involved in the civil war in Syria. President Assad is definitely a bad guy, but so are the radical jihadist groups that are trying to overthrow him. We say that we are conducting operations in Syria in order to fight ISIS, but ISIS forces in Syria are on their last legs at this point. If we allowed the Russians and the Iranians to focus on finishing off ISIS in Syria, that would free up U.S. resources to focus on ISIS strongholds in Iraq and elsewhere. And yet now, as the Trump administration enters its sixth month, the US is being drawn into the very conflict its inaction had been intended to avoid. And as forces the US supports face danger from forces supporting the Syrian regime, the questions will get louder: What is US policy in Syria? And will the fight against ISIS lead the US into a war against Assad? I will try to explain why things have gotten so complicated in the region. In 2011, the "Arab Spring" was raging all over the Middle East. Saudi Arabia, Turkey and their Sunni allies in the region wanted to use that "opportunity" to overthrow President Assad in Syria, and Secretary of State Hillary Clinton and her team decided that would be a wonderful idea. So massive protests against the Syrian government were organized, and money and arms were funneled to anti-Assad groups. Pretty soon a horrible civil war broke out, and it has now raged on for six long years. The Syrian refugee crisis that we are dealing with today is the direct result of this civil war that Hillary Clinton had a hand in starting. And everything was going according to plan at first. The radical jihadist groups that Saudi Arabia and Turkey were backing were winning, and it looked like Assad was going to lose. But then Russia, Iran and Hezbollah intervened, and that totally turned the tide of the war. Saudi Arabia, Turkey and their allies are still absolutely determined to find a way to win the war in Syria, and they see the U.S. as the key. They would love to get the U.S. into the war, but so far the U.S. has been hesitant to get fully involved in another quagmire in the Middle East. But the Trump administration is unlikely to completely stop operations in Syria either, because Trump very much wants to have a positive relationship with the Saudis. As ISIS continues to lose more territory, U.S. forces will increasingly find themselves operating in very close proximity to Syrian, Russian and Iranian forces. We have already had four incidents of conflict between the two sides within the last month, and if we are not very careful we could end up in a major regional war in the Middle East.